Students in SAFS 680 and instructor Andrew Ogden gather at the end of class. Sam Breslin, Josh Pires and Tyler Murray separate garlic based on size. Four students sit outside a high tunnel with cardboard boxes at their feet, breaking the cloves off of garlic bulbs and separating them by size. Some will go to UNH Dining and some will be replanted. As they work, they talk about schoolwork and the upcoming growing season. With the exception of their conversation, the occasional whirr of a truck and a bird chirping, it is quiet on the west side of campus amid fields and cow barns. The students, Sam Breslin ’18, Susanna Bicknell ’18, Tyler Murray ’18 and Josh Pires ’18 are in Food Production Field Experience II (SAFS 680) this semester, known as Farm to YoU NH . The course is offered each fall and is part of the Sustainable Agriculture & Food Systems (SAFS) program. Andrew Ogden, lecturer in sustainable agriculture and food systems and the instructor of SAFS 680, says a “major backbone” of this course is growing and providing food for UNH Dining, mainly the Dairy Bar, Holloway Commons and UNH Conferences and Catering. On average, SAFS delivers 3,000 - 4,000 lbs. of produce to UNH Dining every year. 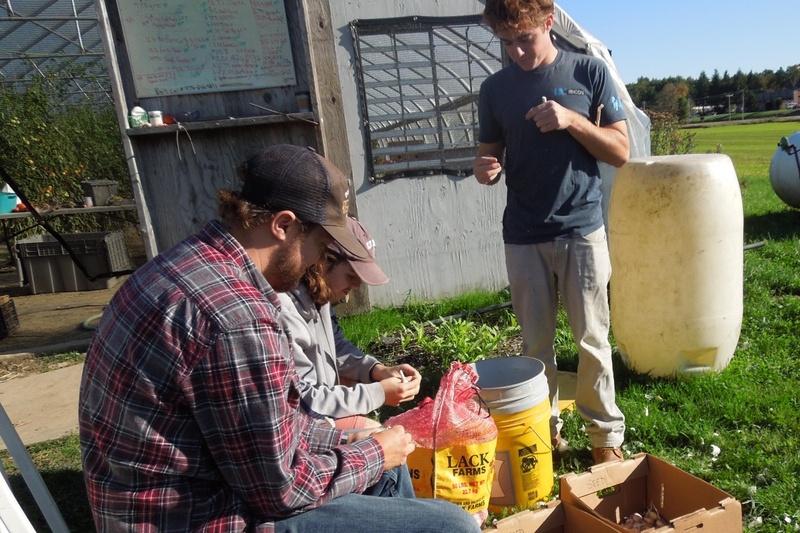 In SAFS 680, students work three-hour shifts on the farm outside of class meetings, where they plant seeds, wash crops and till soil, for example. Tuesdays are devoted to a lecture followed by an activity. On Thursdays, students work in teams on a variety of projects. During the October 12 class meeting, the production team got the garlic ready, while the record-keeping team analyzed crop production for 2017. The social media/community outreach team started work on an informational PowerPoint and reviewed the course’s Facebook and Twitter pages. The propagation team examined tomato plants and decided what needed to be done. Students rotate through the teams as the semester progresses. The SAFS program has B.A. and B.S. degree options. Students take core and elective courses, while designing an emphasis area such as horticulture management or community development. Sam Metz ’17, who took SAFS 680 in fall 2016, recommends that others pursue the major. “Almost every class has hands-on experience where you are either outside, on a field trip or in the greenhouse,” Metz says. “It is so amazing being able to do those things instead of being stuck inside in a classroom the whole day. “We’ve learned a lot about crop production practices in the classroom. Then we get to come out and try them,” Patterson adds. So far, students in the class have made a compost pile and grafted cucumbers on squash plants in order to bring together the heartiness of a squash with the crispness of a cucumber. The course prepares them for multiple career paths, from running a business to becoming a farmer. After the teams completed their work, the students came together outside the high tunnel to help separate the rest of the garlic, reflect on the class and sample pieces of a freshly picked jumbo tomato. Ogden and the students agreed it was a successful class, before heading back down the winding dirt road, tomato slices in hand.